Discover the Many Rewards of Homemade Spirits—Unique, Flavorful, Economical and Surprisingly Easy to Make! Today’s renewed interest in making wine and beer at home amounts to nothing less than a renaissance. No matter why you want to join the new generation of homebrewers—to complement your cooking, to save money, or simply for a truly rewarding hobby—Strong Waters will tell you how. Worried that making your own spirits is complicated? Don’t be! 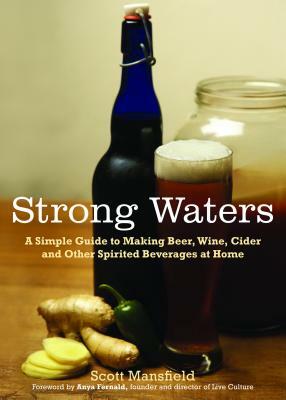 Strong Waters covers everything from the basics of bottling to the science of sweetening. It’s surprisingly easy, and as eight pages of color photos illustrate, the results are tantalizing. Cheers! Scott Mansfield, a native Hoosier, moved to California in the 1970s for college, and stayed on for the people, climate, and lifestyle. He has been making wine, beer, cider, mead, and all manner of fermented beverages at home for the last fifteen years, incorporating local ingredients whenever possible. Always drawn to the outdoors, he also enjoys gardening and cooking.